Quiet with stamina. 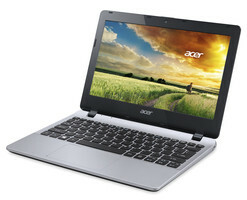 The 11.6-inch Aspire V3-111P notebook delivers a quad-core processor, a very good keyboard and a very long battery life. So, the small computer is ideal as a mobile typewriter that has lots of stamina. 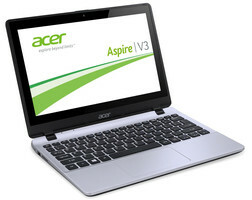 After the 11.6-inch Aspire E3-111 netbook, we now have the Aspire V3-111P with identical design under review. The buyer gets a faster processor, a touchscreen, and a battery with significantly higher capacity for the higher price. Our review will reveal whether the surcharge pays off. Basically, all cheap 11.6-inch computers, especially those with a touchscreen such as the Asus F200MA-CT067H and the HP Pavilion 11-n070eg x360 compete with the Aspire. Since the V3-111P and the E3-111 use the same design, we will not cover case, input devices, connectivity, and speakers here unless there are differences. Please refer to our Aspire E3-111 review for information about these. 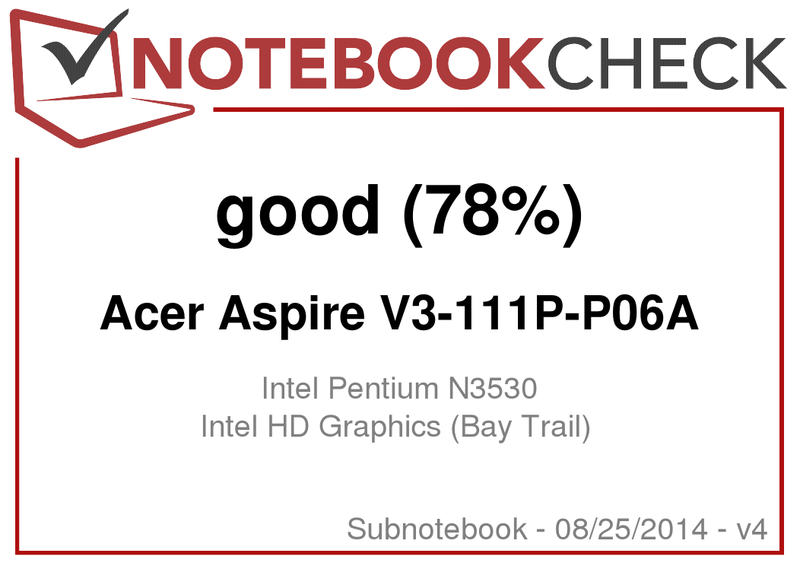 The V3-111P is identical to the recently reviewed Aspire E3-111. Only the lid of the V3-111P is slightly thicker because of the touchscreen. Additionally, you will find another difference inside: The battery capacity of the V3-111P (49 Wh) is larger than the E3-111's (30 Wh). Keyboard and touchpad are identical to the Aspire E3-111's. But, the touchscreen is new. It works flawlessly and is responsive. The Aspire uses a glossy 11.6-inch display with a resolution of 1366x768 pixels. The measurement results are nothing special. The brightness of 222.2 cd/m² is slightly better than normal in this price range. Contrast (343:1) and black value (0.68 cd/m²) reflect the price. In factory state, the average DeltaE 2000 deviation is 10.29 and is clearly outside the target range (DeltaE smaller than 3). This is not surprising and is expected in this price range. In addition, the display is clearly bluish. The display's glossy surface makes outdoor use more difficult. You can basically use the notebook in not too bright environments. The incorporated display is a simple TN model with limited viewing angles. 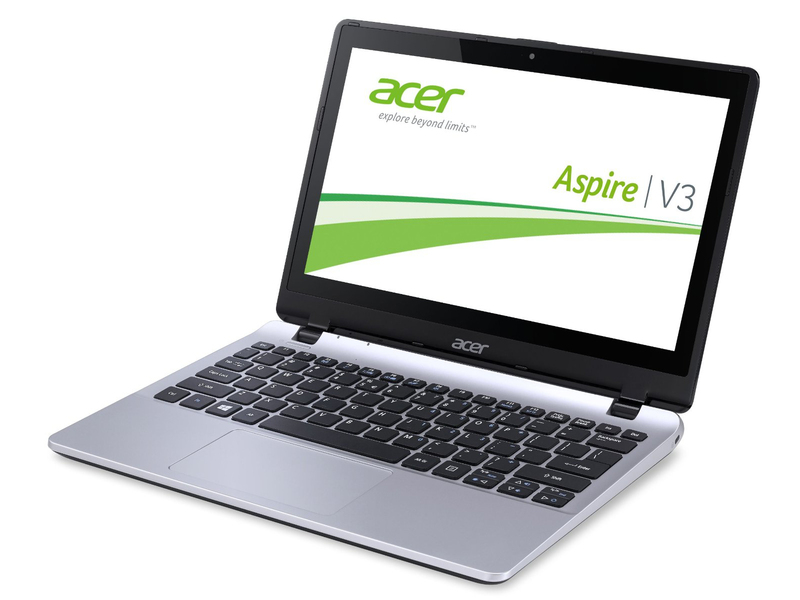 The Aspire V3 111P series consists of 11.6-inch notebooks with touchscreen. The review model costs about 380 Euros (~$500) and is already available for about 320 Euros (~$420) without Windows OS. The Aspire is powered by a Pentium N3530 quad-core processor (Silvermont architecture). The Pentium uses a base clock of 2.16 GHz, which can be increased to 2.58 GHz thanks to Turbo. The CPU's TDP is 7.5 Watts. The processor runs at full speed in AC mode and on battery. It clocks at 2.58 GHz in all CPU tests of the Cinebench benchmarks. 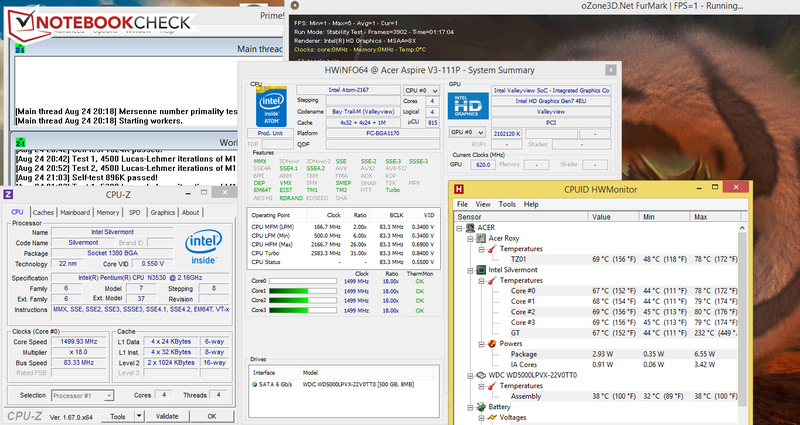 The Aspire has the most powerful processor in our comparison (see figures). The small computer works smoothly. You can also feel that the processor is faster than the E3-111's in use. Accordingly, the results of the PC Mark benchmarks are significantly better. Acer equipped the Aspire with a hard drive from Western Digital with a capacity of 500 GB and a speed of 5400 rpm. Overall, the transfer rates are good and on par with most 5400 rpm hard drives. The Aspire uses Intel's HD Graphics as GPU. It supports DirectX 11 and clocks up to 860 MHz. The results of the 3D Mark benchmarks show that it belongs to the lower end of the scale in terms of performance. The Aspire cannot run demanding computer games. Only a few games reach smooth frame rates with low resolution and quality settings. It is different for games made for the touch interface of Windows. These usually run flawlessly. Like the Aspire E3-111, the Aspire V3-111P does not have a fan. Thus, you can only hear a quiet noise from the hard drive when in use. The Aspire never suffers from too high temperatures. Even during the stress test, it only exceeds 40 degrees Celsius (104 degrees Fahrenheit) in two quadrants. It remains even significantly cooler than the Aspire E3-111, which also features a Silvermont quad-core processor. We observed that the CPU and GPU clock of the E3-111 are only throttled after the CPU temperature exceeded 90 degrees Celsius (194 Fahrenheit). The Aspire V3-111P throttles significantly earlier (at about 70 degrees Celsius, 158 Fahrenheit). As a result, the case remains significantly cooler. Regardless of the power source, the Aspire behaved the same way during the stress test (Prime95 and FurMark run simultaneously for at least one hour). Processor and graphics core run at full speed for about 6 to 7 minutes. At that time, the processor reaches a temperature of about 70 degrees Celsius (158 Fahrenheit) and its clock rate is throttled to 1.5 GHz. The GPU clocks at about 600 to 700 MHz. As soon as the temperature exceeds 70 degrees Celsius (158 Fahrenheit), the processor clock falls to 500 MHz for a short time and increases to 1.5 GHz again. This occurs repeatedly during the test. The CPU temperature increases to up to 70 degrees Celsius during the stress test. The small 11.6-inch computer comes with a frugal CPU and does not need much energy. While idling, the power consumption is significantly lower than 10 Watts. Certainly, the power consumption increases under load. The computer needs less energy during the stress test (Prime95 and FurMark run simultaneously) than under medium load (3D Mark 2006), since CPU and GPU clock are throttled. Our realistic WLAN test automatically loads a web site in 40-second intervals. The energy saving-profile is active and the display brightness is set to about 150 cd/m². The Aspire achieves a very good battery life of 8:21 h. The Aspire E3-111 performs significantly worse. This is not surprising since the V3-111P's (49 Wh) battery capacity is larger than the E3-111's (30 Wh). The Aspire V3-111P is basically identical to the Aspire E3-111. Therefore, these two computers have basically the same strengths and weaknesses. We only cover the differences between the two netbooks. The Aspire V3-111P costs about 130 Euros, (~$170, with Windows OS) or 70 Euros, (~$92, without Windows OS) more than the Aspire E3-111. The buyer gets a faster CPU, significantly longer battery runtimes and a touchscreen for the surcharge. You can question whether a touchscreen is a useful feature in a conventional laptop. But, the surcharge for the faster processor and the bigger battery pays off. Overall, the CPU makes working smoother and the battery life is sufficient for a typical day at work or at the university. 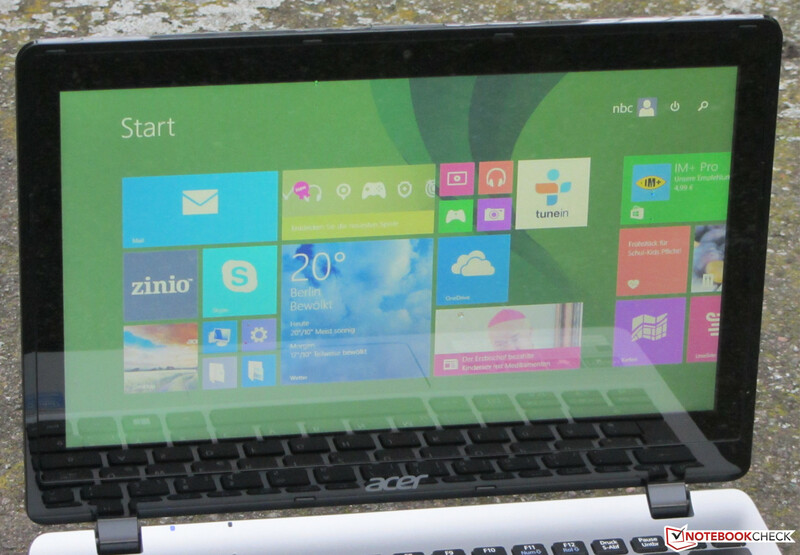 It would be perfect if Acer released another V3 model with a matte display instead of a touchscreen. The battery life and the virtually silent system noise. Long battery runtimes are not usual in the price range of the Aspire.